Pope John Paul II wrote that "each man, in his suffering, can also become a sharer in the redemptive suffering of Christ." (CNN) -- Pope John Paul II used to beat himself with a belt and sleep on a bare floor to bring himself closer to Christ, a book published Wednesday says. The late pope had a particular belt for self-flagellation and brought it with him to his summer residence, according to the book, "Why he is a Saint: The True story of John Paul II." "As some members of his own entourage were able to hear with their own ears, both in Poland and in the Vatican, Karol Wojtyla flagellated himself," the book says, using the name the pope was given at birth. "In the closet, among the cloaks, a particular pant-belt hung from a hook, which he utilized as a whip and one which he always had brought to Castel Gandolfo," the book says. The book was written by a Vatican insider, Slawomir Oder, with Italian journalist Saverio Gaeta of the Catholic weekly Christian Family. 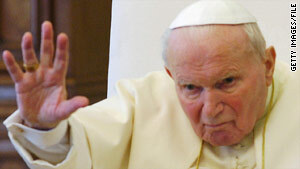 Oder is head of the Vatican committee investigating whether John Paul II should be declared a saint. John Paul died in 2005. The evil albino monk in Dan Brown's "The Da Vinci Code" may be the best-known example of self-flagellation these days, but the practice is not unusual in Catholicism -- or nearly as extreme as it is shown in the movie. "When members or former members [of Opus Dei] see the monk go at it in the movie, they just burst out laughing, it's so nutty," said the Rev. Michael Barrett, a priest of the Catholic Opus Dei sect. In actual Catholic self-flagellation, "there is no blood, no injury, nothing to harm a person's health, nothing traumatic. If it caused any harm, the Church would not allow it," he wrote on Opus Dei's Web site when the movie came out in 2006. "This voluntarily accepted discomfort is a way of joining oneself to Jesus Christ and the sufferings he voluntarily accepted in order to redeem us from sin. 'The Da Vinci Code's' masochist monk, who loves pain for its own sake, has nothing to do with real Christian mortification," Barrett said. Mother Teresa is among famous Catholics who self-flagellated in some way, Barrett said. Catholics are not alone in choosing to inflict pain on themselves for religion reasons. Some Shiite Muslims lash themselves until they bleed when marking the mourning period of Ashura, while fasting is practiced by people in several religions, including Jews on Yom Kippur, the day of atonement. David Gibson, a journalist who worked for Vatican Radio when John Paul II was pope, pointed out that the pontiff wrote an apostolic letter -- essentially a papal position paper -- on suffering in 1984. "Christ did not conceal from his listeners the need for suffering. He said very clearly: 'If any man would come after me ... let him take up his cross daily,' " the pope wrote, quoting the Gospel of Luke. Jesus, the pope wrote, "suffered in place of man and for man. Every man has his own share in the Redemption. Each one is also called to share in that suffering through which the Redemption was accomplished. "In bringing about the Redemption through suffering, Christ has also raised human suffering to the level of the Redemption. Thus each man, in his suffering, can also become a sharer in the redemptive suffering of Christ," says the letter, Salvifici Doloris, On the Christian Meaning of Human Suffering. "John Paul was a product of a very Old World Polish Catholicism," said Gibson, who now writes on religion for Politics Daily. "He was a very disciplined man and a very rigorous man in his personal spirituality," he said. The authors of the new book clearly approve of any whipping the pope did of himself, he added. "Even though it's going to weird people out, it's obviously seen by his postulators as a sign of his holiness," he said, using the technical term for the person who investigates a person's qualifications for sainthood. He said the idea is not as bizarre as it might sound to contemporary ears. "The idea of fasting, renouncing something, giving up your Starbucks latte so you can send money to Haiti -- you can't simply look down your nose at it without rejecting a lot of other ideas about self-sacrifice," he said. The authors of the book based it on interviews with 114 "witnesses" and access to unedited documents in the Vatican's archives, according to the publisher, Rizzoli. The book is available only in Italian, but the publisher is having it translated into Polish and other languages.